MMNLA offers top notch on-site mobile live scan and ink fingerprinting for businesses, individuals and organizations throughout the Los Angeles area. The service is available at anytime or day, evenings and weekends with a 24 to 48 hour notice. I ensure that all live scan fingerprint transactions are transmitted within 24 hours to the state and federal government. If an applicant is rejected for quality, I will return for a complementary re-submission. We process live scan fingerprinting 7 days a week. Our service also offers black ink rolled fingerprinting using fingerprint cards and State of California certification, DOJ approved. Get fingerprinted without leaving your house or work. We are a Certified CERTIFIX Live Scan Fingerprinting Provider. Please call to make an appointment for Live Scan Fingerprinting Service at 1-818-468-6197 now! We offer authentic Live Scan Digital Fingerprinting for DOJ (Department of Justice) and FBI (Federal Bureau of Investigation). DOJ and FBI background checks within minutes and mobile notary services. We can meet you anywhere in the Los Angeles area. We can travel to your house, office, virtually any building in LA or surrounding county. We understand it can be tough to find an operator for live scan fingerprint. Below are a few examples that makes us stand out from the rest. Mobility - We travel to you. No need to call an Uber or Lyft, we’ve got you covered. Up to date equipment - We use the newest equipment on the market. Our equipment ensures a 100% image integrity. Group Bookings - If you set a day to have multiple fingerprinting completed, we will offer a generous discount. Call for details. Professional - Our courteous certified operator will travel to you to conduct Mobile Live Scan fingerprinting for an event or at your home. 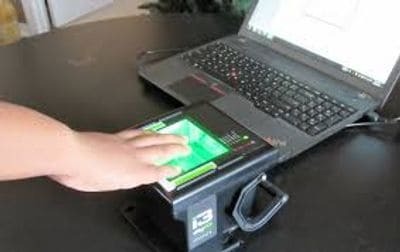 Price - Our mobile Live Scan fingerprinting service is efficient and cost effective. Convenience - The service is available from 8:30 A.M. - 8:30 P.M . Extended hours are available with a 24 to 48 hour notice. Time Efficient - We ensure that all transactions are transmitted within 24 hours to the DOJ and FBI. Quality - We offer free re-submissions for any fingerprint transactions that were rejected for quality. 8:30 A.M. - 8:30 P.M. - Our certified Live Scan Fingerprint providers will travel to the location of your choice for a $100.00 mobile fee. Travel and Setup Fee to your Location = Starting at $150. Varies on distance of location and time of travel. Please call for group discounts. For organizations that have large groups of individuals or executives that need on-site fingerprinting, a Certified Certifix mobile fingerprint operator can travel to you to provide the fingerprinting service at a convenient time and place. There are additional fees for after hours Live Fingerprint Scanning, holidays, and significant travel. Please call us at 818-468-6197 for a quote. All fees listed above are paid at the time of service unless paid in advance using a credit card. Discounts available for large groups, schools, and public agencies. If you have any questions about what we can do for you, please call 818-468-6197 now, I’ll be glad to set this up for you. Please check our Rates Page for more info! Real Estate Licensees, DMV Licensed Professionals, Notaries, Foster Parents, Teachers, Appraisers, Care Givers, etc.